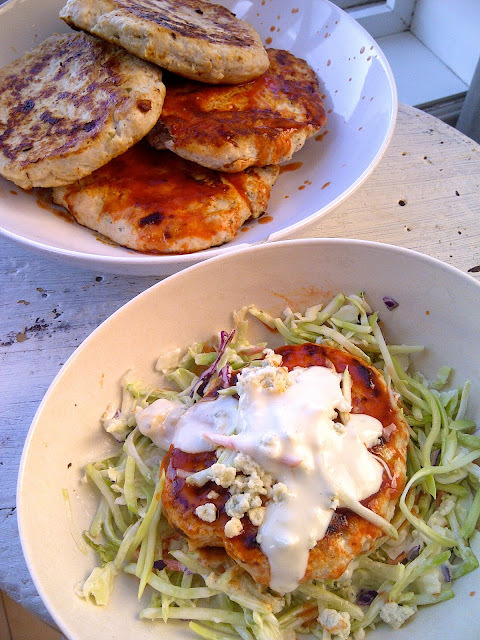 These buffalo chicken patties - with blue cheese slaw - to be honest, are my lazy version of the infamous wing/tender deal. I'm not jackin' around with a fryerlator every time we need a Frank's Red Hot and blue cheese fix. Sure, you could go all dippy-dredgey with the 1-2-3 (flour, egg wash, breadcrumb/cracker meal), but like I said - this is my lazy version, 1-2-3-ing wings/tenders would require effort...and lighting the oven. While we're on the subject of blue cheese, just for the record, we are TEAM BLUE CHEESE in our house. Sorry, ranch dressing - we-don't-want-you, gettoutahere!! For all things buffalo: blue cheese all the way! 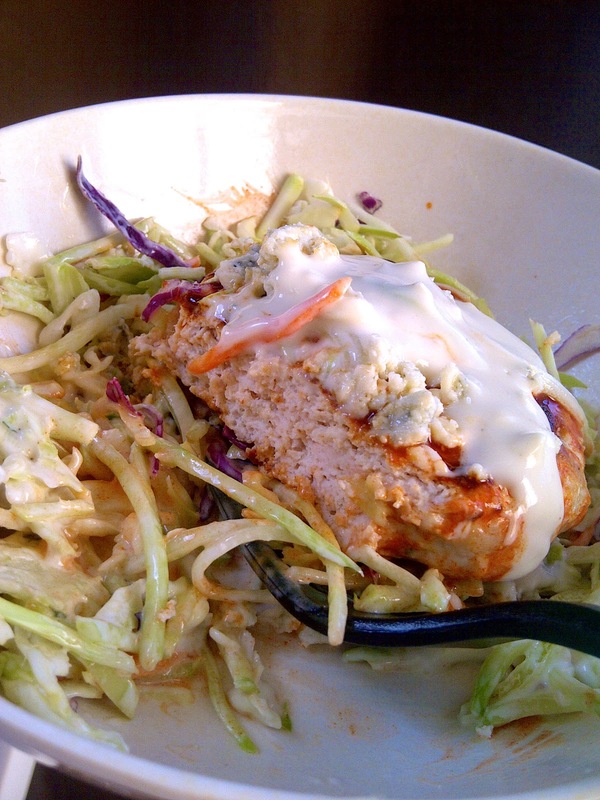 We didn't always like blue cheese; if you had checked in with us years ago, we would have thumbed our noses at it. It's kinda funny how we were introduced, then seduced by this smelly concoction (yes, you can be seduced by dressing....not creepy or weird). S use to select orders in a food warehouse. One night a 3 gallon tub of blue cheese dressing fell from an above slot onto the area he was working...or he dropped the tub...I can't remember exactly. I do know that when the tub ruptured on the ground, the back-splatter COVERED S's face, and the rest of him from the waist up. Inadvertently, he ate some...and was hooked. When he got home that night (with a freezer suit for me to wash), he was all gung ho to have blue cheese now with buffalo wings. Since then, we've had just about everything buffalo-style. 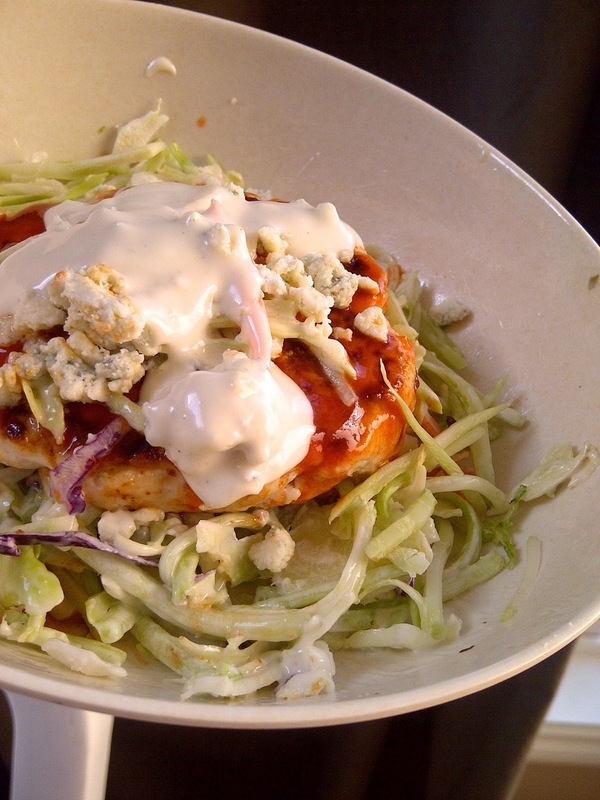 It's shocking that this is the first post, as Red Hot & blue cheese dressing is a must-have in our house. The addition of blue cheese crumbles into the ground chicken, and little bit of powdered ranch dressing mix (I know, I just had forsaken poor ranch) gives a nice tang to the patties. For a richer sauce, by all means - don't let me stop you - you could mix up some melted butter with the Red Hot. Again, lazypants here...I just shook on the Red Hot, turned to coat, and was on my way. Instead of a bun, I nestled these patties in some blue cheese slaw. 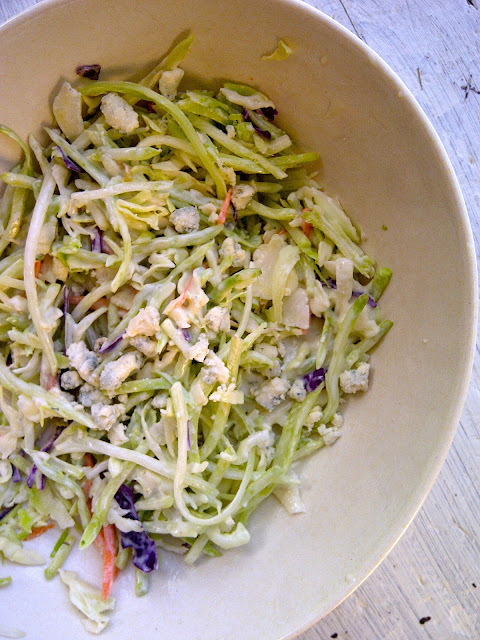 I used a broccoli, cabbage, carrot blend; dolloped on some blue cheese dressing, and added some blue cheese crumbles. Seeing how I was going bun-free, I opted to top the patty with a little more blue-cheesy-goodness. This made 4 huge patties, and 1 normal sized patty (as shown in the pictures). You could even roll the meat out into meatballs if you wanted to get a little crazy. I did cook these on the stovetop, they were a little too gooey for the grill, you now how ground chicken can be sometimes, right? To help when shaping, wet your hands a bit - this will prevent the mixture from sticking to your hands. Combine chicken, cheese crumbles, egg, breadcrumbs, and ranch powder in a large bowl - mix well. Divide into 5 XL, or 8 regular sized patties. If mix is too sticky, lightly dampen hands while shaping. Heat a large nonstick skillet over medium-high heat. Add burgers to hot pan, cook 4-5 minutes on one side (until nicely caramelized and browned), flip and cook the other side the same way, until the juices run clear and no visible pink remains in the middle. Divide slaw up amongst serving bowls. 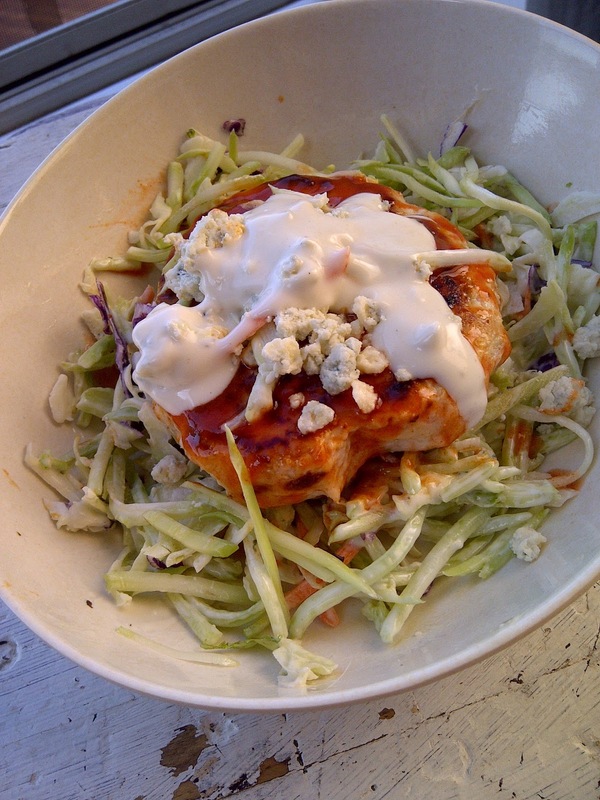 Toss with a spoonful of blue cheese dressing - use your judgement :) and a few crumbles of blue cheese, if desired. Toss patties in hot sauce, use the desired amount that works for you. 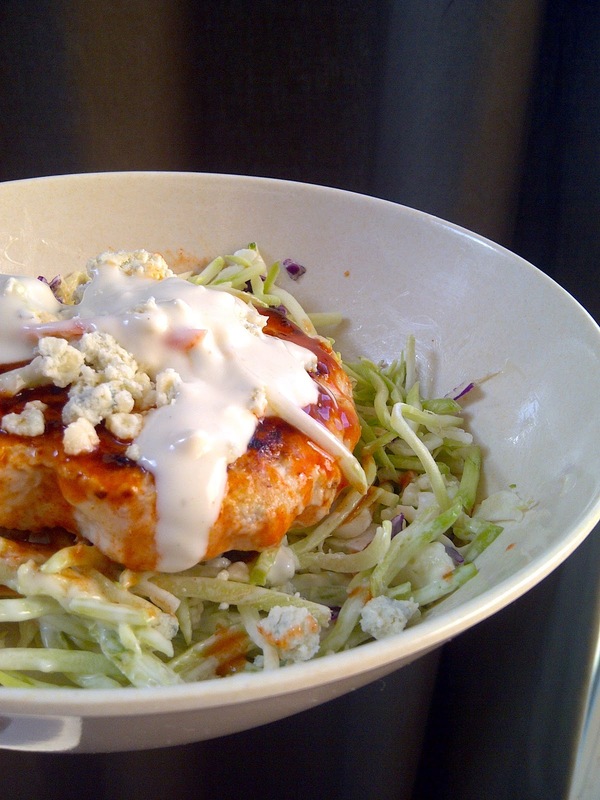 Serve atop the blue cheese slaw with additional blue cheese dressing, and blue cheese crumbles, again, if desired. 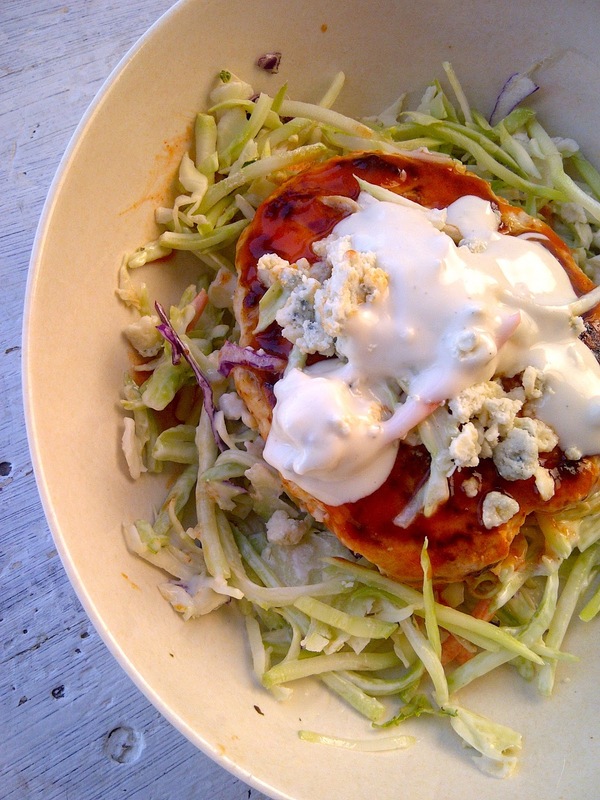 I love broccoli slaw, but not regular cole slaw, so I'm glad to see your recipe! Can't wait to try this twist on burgers and slaw. I'm visiting from The 36th Avenue link party. Yes, I agree...it's a texture thing too, right? Thanks for stopping by!! Ok, you definitely got be with buffalo and bleu cheese. Oh my yum. Thanks so much for linking up at my "Best Of The Weekend" party! Have a great weekend! I can but hot sause & blue cheese on just about anything :) Thanks for hosting, Claire!! I appreciate the feature & will be back this week ! It is interesting seeing your patties Kim. We have patties here but they have a slightly different shape. This meals looks delicious. I am hearing about blue cheese for the first time. Thanks for sharing on Creative Monday. Thanks Heather, team blue cheese is proud to have you! !